Pre-soaking the calamari in milk before cooking is one way to get this delicate squid nice and tender. Slice calamari, bodies sliced into ½ inch rings, tentacles left whole. 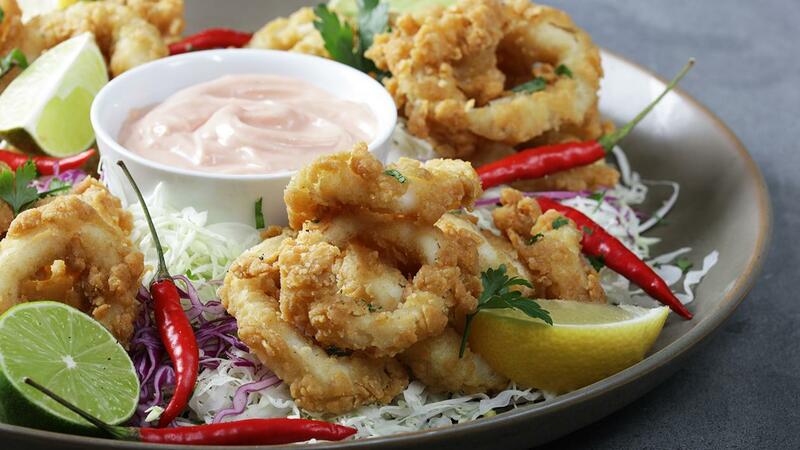 Soak calamari in milk for 6 hours to ensure tenderness. Marinade the calamari in Knorr Coating Mix Spices for 2 hours’ max. Mix the Knorr Coating Mix with flour. Coat marinated calamari in dry flour and Knorr Coating Mix and then dip into cold water for 10 seconds. Coat the calamari again in the dry flour mix. Deep fry in preheated oil of 170°C. Combine shredded carrots and cabbage with Best Foods Real Mayonnaise, also add freshly chopped mint and a little Knorr Lime Seasoning. Once calamari is fried season with Knorr Lime Seasoning.